Jenny Maj is an artist and plush maker living in Greensboro, North Carolina. 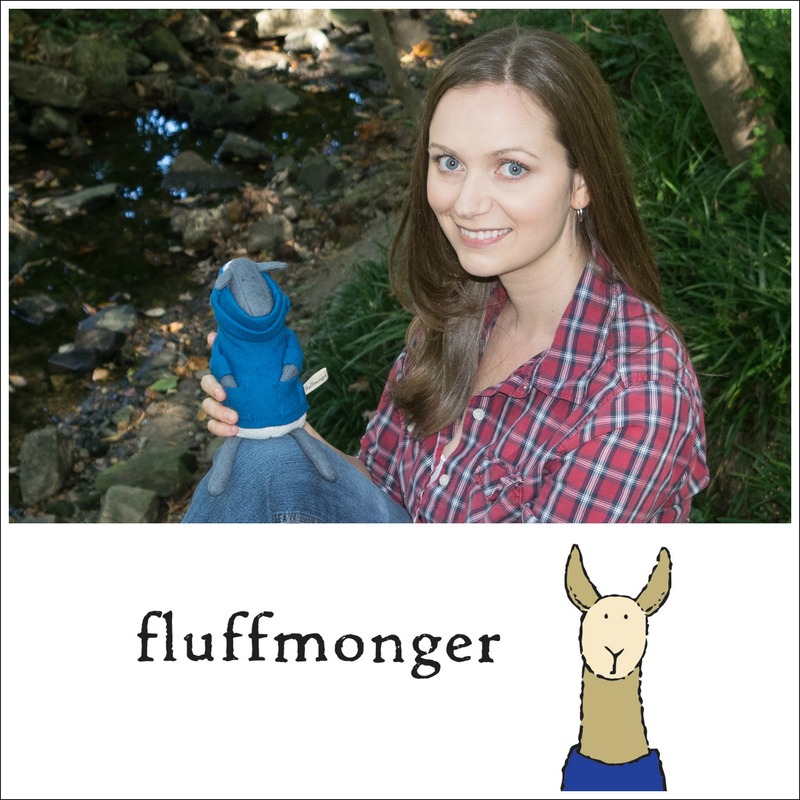 She is a member of my private Facebook group for soft toy designers and earlier this month announced that she’d opened a shop on Etsy called Fluffmonger to sell her plush toys. When I saw the images Jenny had created for her Etsy listings I was so struck by her creativity and artistry. Let’s take a look. 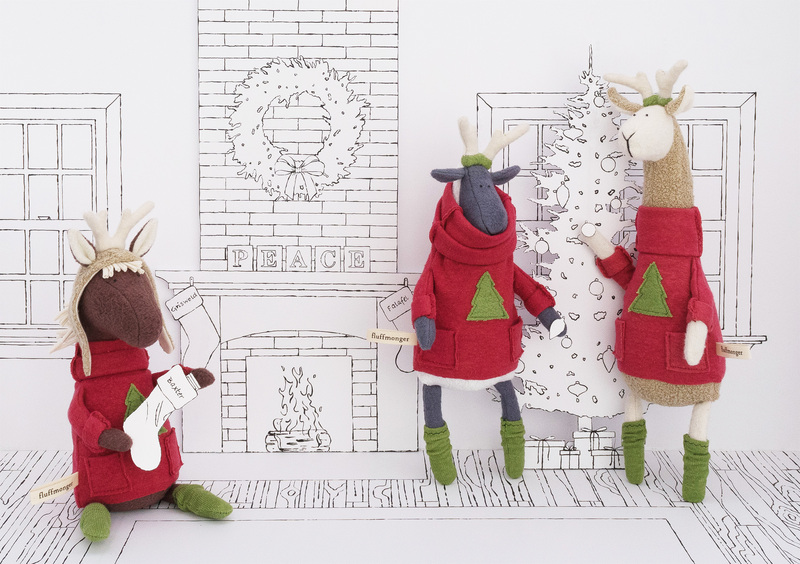 Baxter the Horse in a green hoodie by Jenny Maj.
Falafel the Llama in a red sweater by Jenny Maj.
Griswold the Sheep getting coffee by Jenny Maj.
Jenny has a degree in sculpture from the University of North Carolina at Greensboro and is licensed as an art teacher. She focused on figurative pencil drawings and ceramic sculpture in high school and college, but says she was never really passionate about anything until she started designing stuffed animals. I want to incorporate the use of materials that are better for my health, the health and well-being of others, and the environment so I choose to use organic and ethically made materials that I hand dye using low environmental impact dyes. When I decided I wanted to start selling plush designs that I made using only organic and ethically made materials, I had to cut out a lot of things like safety eyes, faux fur, fusibles, and polyfil. That pretty much left only embroidery for making the eyes and mouths, and embroidery is not my forte, so I decided I needed make simpler designs for my pieces. I wanted to create a line of characters that each had its own story line with an underlying theme that tied it together with the others. I felt that their designs needed to be similar but unique enough to give each its own personality. I started with the llama, then, using the same simple design, I created the sheep and the horse. All of the animals are about the same size: 10″ and 13.5″ tall when standing. The toys are like an adorable family or community. I asked Jenny if she would explain how she creates the backdrops and what effect she feels they have on the way her shop looks and the way potential customers perceive her toys. I feel that the backdrops help draw customers into the world of each individual character. 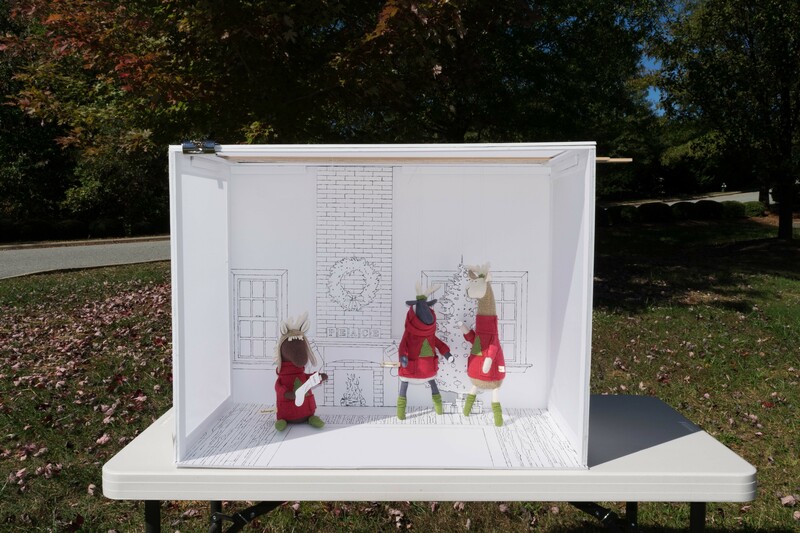 I have always loved pop-up books and architecture, so I decided to make my 3-dimensional characters interact in an environment made of 2-dimensional drawings set up to look like a pop-up book. I chose to make the backgrounds black and white so that the characters remained the center of focus. 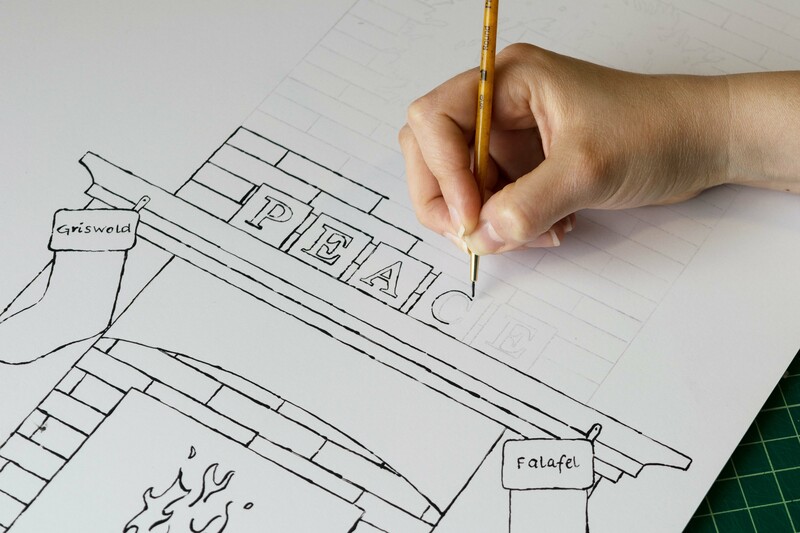 I draw my backdrops first by hand. 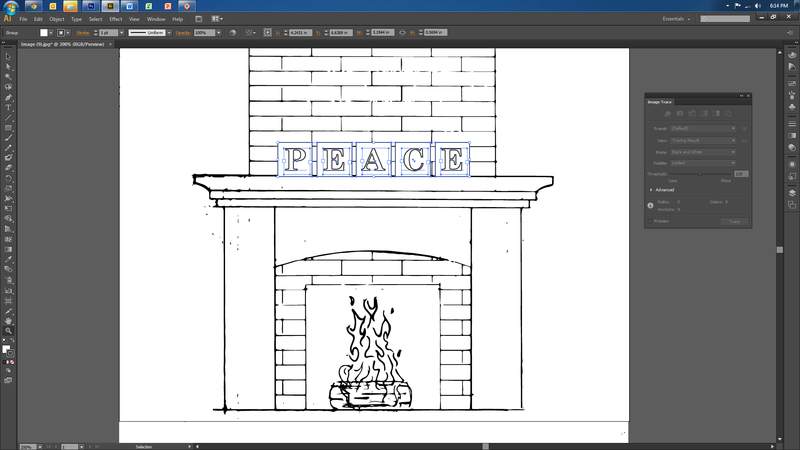 If I need to add text, or if the backdrop requires the same drawing to be repeated, like the leaves I made for the park scene, I’ll scan my sketches into Illustrator to edit them. I then transfer the drawings onto foam board, go over them with black acrylic paint, and cut them out with a craft knife. I put all of the backdrops and props into light boxes I make. I take regular cardboard boxes, cut out four sides, and cover the holes with white muslin to diffuse the light. 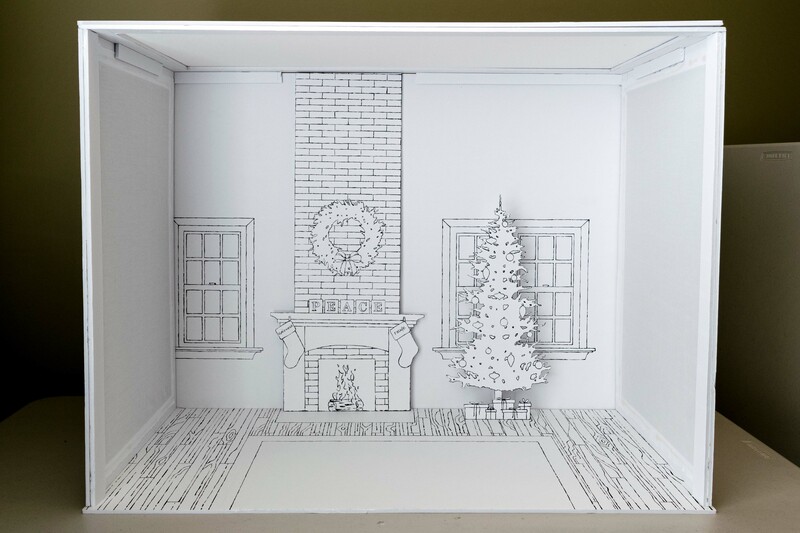 Most of the scenes you see in my shop are made in 16″ x 18″ x 18″ cardboard moving boxes. If I can’t find a box with the right dimensions I’ll make one out of foam core. The hole at the top of the box allows me to hang each plush piece from a yard stick and pose it however I like in the scene. If I decide to have one of the characters holding something or crossing its legs, for example, I’ll use thread to stitch them in place. I’d say for simpler scenes it probably takes me a day or two to make the entire scene. The Christmas scene took me close to a week, however. Painting the outlines is the most time-consuming part. I shoot the photos with a Nikon D5300 and an 18-55mm lens. 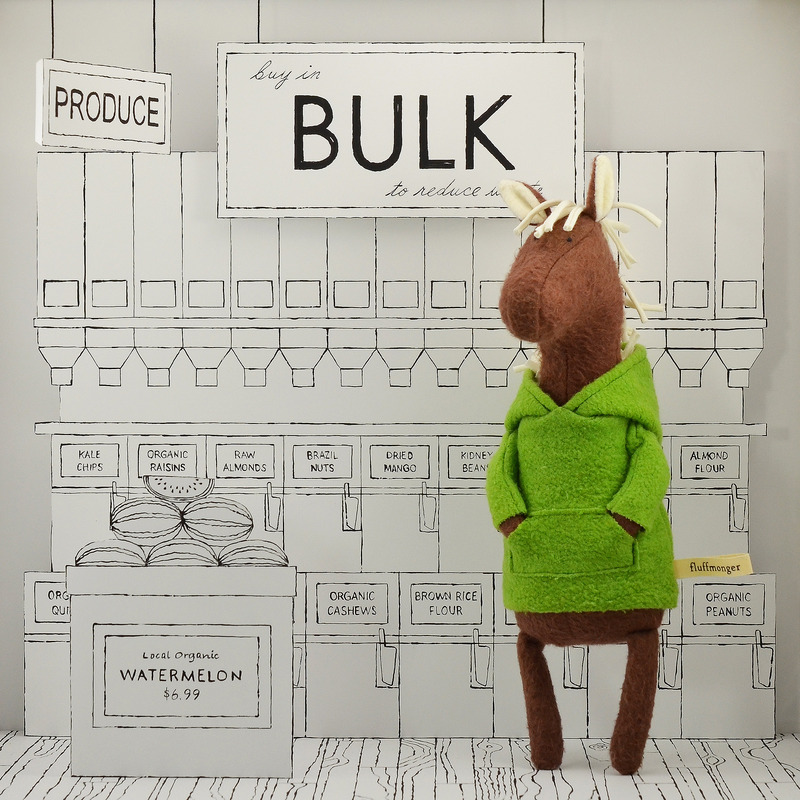 To me, Jenny’s style is well-suited for illustration or stop-motion animation. Sure enough, she’s thought along those lines. When I was a younger, I always said I was going to write and illustrate children’s books. I’ve actually written one, I’ve just been too afraid to do anything with it. For some reason, drawing seems to be more stressful to me than making 3D art, so I can definitely see myself using this style to illustrate any books I may publish in the future. Check out Jenny Maj’s softies in her shop, Fluffmonger on Etsy, and follow her on Facebook to see what’s new. I think she’s one to watch. Wow, what a fabulous complete story Jenny offers with her toys! Its very interesting to learn how she develops her concepts and creates the shadow boxes to support the story. Thank you for sharing her charming work! 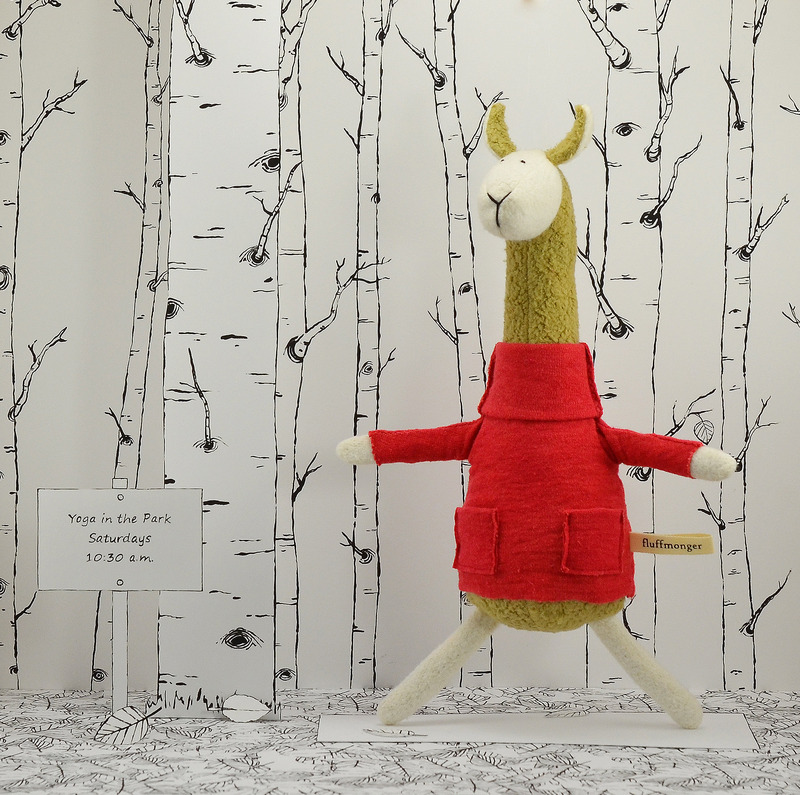 Wow — the animals and their trendy clothes are extremely cute, but the styling is incredible! Ohhh these animals are gorgeous!! 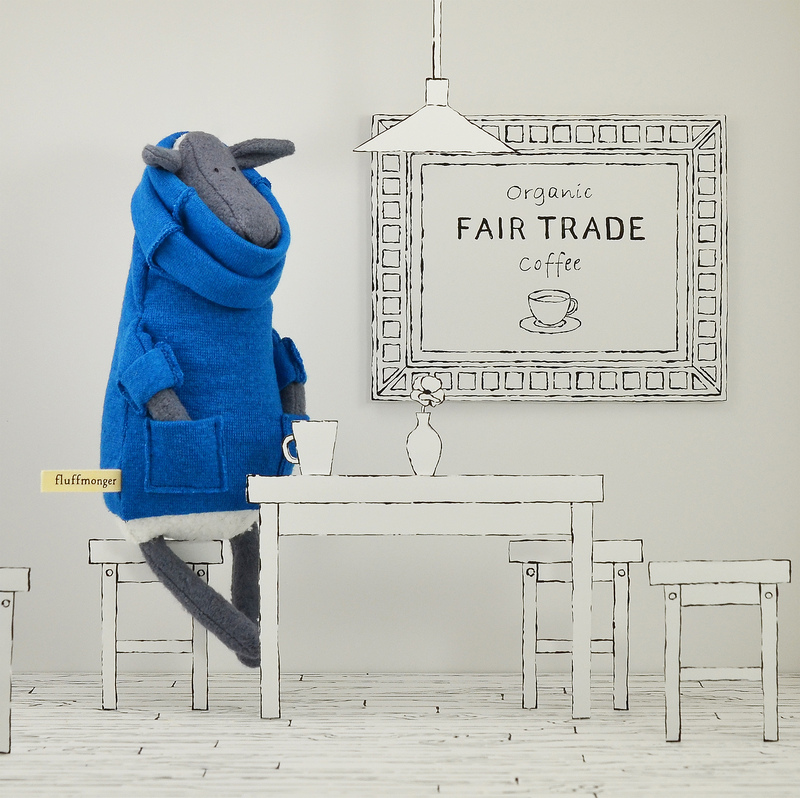 The horse with the hoody is my favourite although the coffee sheep comes close, what a find!! Thanks for sharing this Abby & Jenny, very inspiring. I was so impressed with the sheep with the cowl sweater. Thanks for sharing Abby! I’m not a sculptor, and I barely sew a herringbone stitch, but there is an enormous amount of inspiration in Jenny’s work. The excitement to complete a project built over time with your own hands makes a hurried finish so tempting, but this post is an enticement to see each and every element through, in series, to 150% completion. Her plushies are adorable all by themselves, but the amazingly creative backdrops , and the humor and artistry in their staging is superb. I’ll carry her see-it-through work ethic and creative mojo with me to the studio today, and I thank you both for that. Awesome post. You put it to elegantly, Belinda. Thank you for this lovely comment about Jenny’s work. Thank you for the sweet comments, Belinda! Oh, Jenny! How wonderful these are! As you do, I love both stuffed animals and pop-up books. What a clever way of combining these two interests. I’m looking forward to reading about the adventures of Baxter, Falafel, Griswold, and their friends. Thanks Jenny & Abby for this inspiring post. Hi Abby! You are right – this woman is going places. Totally adorable and I think Jenny needs to revisit her children’s book and not be too timid to approach a publisher! Go Jenny! Thank you Abby! Absolutely wonderful work – I love every aspect. And what a joy it was to read about Jenny’s process. Looking forward to her books! Wonderful post. Thank you, Abby, for sharing all the “treasures” (people, projects, ideas) you come across. Jenny, do go ahead and approach publishers. They will love your work. And you have this wonderful blog post that practically tells them everything they need to know about you and all you need is just a brief intro. I love your toys, and your backgrounds! I’m a bit of an artist myself, dabbling in all sorts of mediums, but I’ve never had any profession artistic training. At the moment I design and sew doll clothes to sell on Etsy, along with a zillion others, but I would like to make my clothes stand out a bit. Sketching has always been one of my favorite artistic activities so I would like to borrow your background idea, if you don’t mind. I would not copy you designs but would like to use your concept, and I’m writing to you hoping to get you permission to borrow your idea to sketch some backgrounds of my own design. 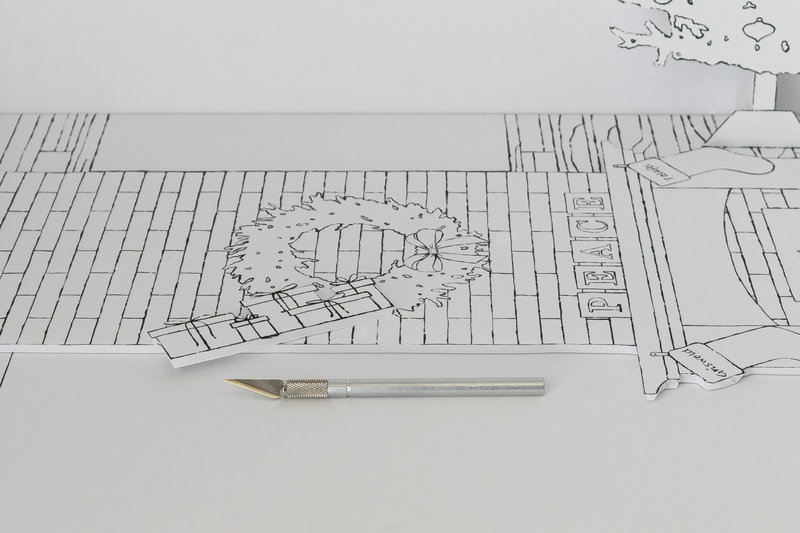 Just to answer on Jenny’s behalf – it’s totally fine for you to draw backgrounds for your product shots without Jenny’s permission. I think a big part of the purpose of this post was to show a creative and innovative way to create backdrops for photos that will really make them stand out. If you’re inspired by Jenny’s work and want to draw some backgrounds, go for it! Thank you , Abby ! I apologize for the late reply, but I’m glad Abby responded to you. I appreciate you asking for my permission. I’m sure I’m not the first person to draw a background for photographing products, so feel free to sketch your ideas for your backdrops. I’d love to see what you come up with! Take care!